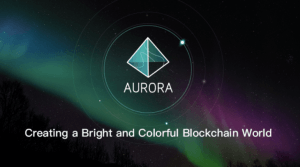 Aurora is a smart contract blockchain platform encompassing the Aurora chain and its Aurora token (AOA). Both were presented in May 2018 as the answers to the challenges relating to scaling, speed and security faced by this blockchain generation. a) Video Gaming Industry. Aurora hopes to integrate in-game currencies, game data and game rules with its blockchain. Everything would be “tokenized”, including game props and equipment, with the tokens made tradable as part of an open economy. b) Artificial Intelligence. Aurora aims to link data security and synergy by moving away from the concept of centralized networks that have trouble enabling streamlined communication between nodes. c) Internet of Things (IoT). Aurora’s blockchain wants to become a foundation stone of a future decentralized IoT system which profits from transactions and collaboration among the connected yet independent devices. d) Big Data. Improved security and data management offered by blockchain are seen by Aurora developers as the bridge linking these two important technologies. Blockchain adoption by other industries is seen as too slow. Going beyond the focus on digital asset management, Aurora sees blockchain as the platform for cross-sectoral cooperation among diverse industries. This is to be achieved by allowing the companies and organizations to integrate their internally developed applications and rules into the blockchain and use these to establish links with businesses in other industries. Smart contracts need to be perfected before being turned into building blocks of the future blockchain economy. The Aurora platform aims to develop smart contracts with robust underlying support, flexible tools and transparent coding in order to make them equally useful for diverse industries. Its public chain is seen as the main source of support in an effort to make smart contracts faster in execution and closer to the business mainstream. Transaction processing needs its own speed kick and Aurora promises to deliver it. 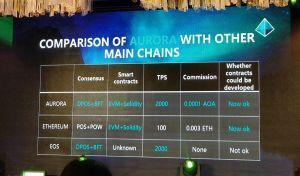 An area of blockchain tech which has often come under criticism is the transaction throughput and Aurora aims to speed up the processing times by merging the existing technologies with its novel ones. Blockchain needs to be ready for constant and efficient upgrades. The Aurora wants to offer blockchain architecture which is fully upgradeable, with the aim to automate this process in the long run. This is to be achieved with the help of technologies such as the automated upgrade of block heights and self-grouping of clusters. Their implementation is supposed to make the ecosystem development faster while bringing down the cost of data storage capacities for the end users. What Is the Technological Combo Offered by Aurora? Delegated Proof-of-Stake (DPoS) consensus mechanism. Delegated Proof-of-Stake mechanism is implemented on the Aurora platform as a technology which is supposed to deliver the governance model resembling that of a “representative democracy”. DPoS allows the holders of Aurora tokens to use their balance as a stake in voting for delegates. The voter’s stake is what determines the symbolic weight of one’s vote, meaning that those who invest more in the system will have more say in the matters related to the Aurora chain. Even the delegates who do not own large stakes can compete with each other if they want to collect votes and get compensated in the process. This is supposed to promote decentralization in addition to enforcing a sort of a “digital democracy”. In the case of Aurora, the system features a threshold by which an account can apply for the candidacy of an AOA proxy, with the required balance set at more than 5 million AOA tokens. Voting rights for proxy candidacy are extended to each address which holds sufficient balance of AOA tokens. In case the proxy candidate’s balance goes below the required amount, the candidacy is automatically rejected. At the same time, the highest ranking 101 candidates that have secured the most votes are automatically designated as proxy nodes in charge of managing transactions. To ensure a “democratic” outcome, each address is allowed to vote for each candidate provided that the maximum quota of 101 votes has been reached. Finally, casting one vote entails locking 1 AOA token until the end of the voting process. At the same time, the implemented DPoS system on the Aurora is seen as the tool which is supposed to bring about both higher individual transactions speeds and increased number of processed transaction per second (TPS). At the moment, its TPS value stands at 2000, with the commission amounting to 0.0001 AOA. There is also the promise of higher security without the issues that Proof-of-Work and standard Proof-of-Stake models face. At the same time, this model wants to become suitable for running numerous applications requiring high levels of scalability, in line with the Aurora’s goal to establish itself as the platform for the easy development of applications. In addition, Aurora developers decided to combine their DPoS mechanism with the Byzantine Fault Tolerance optimization system to further upgrade the platform’s scalability and reduce the risk of unwanted forks which can take place with fast-consensus mechanisms. The speed by which transactions are processed is ensured by providing the select individual users with the power to indicate and confirm transactions, instead of waiting on prolonged verification of each individual transaction by less trusted nodes. This allows for the faster execution of smart contracts, which lie at the core of Aurora’s ambition to compete with the likes of Ethereum and EOS. There is also the issue of security in which the combination of DPoS and the BFT may yield better results. With its BFT system in place, the Aurora network has the capacity to keep both its operation and consensus mechanism alive, while dealing with the malicious nodes which may spread false information. Based on this, the Aurora platform features systems whose main task is to detect which components in its ecosystem (a server, for example) are faulty by means of the BTF consensus and shut them off from the rest of the network. In this manner, Aurora can prevent catastrophic failures and reduce the impact of undesirable nodes on the system’s functionality and consensus-reaching mechanism. Reward distribution should be more equitable: In theory, the users will be incentivized to elect the delegates who offer the best rewards for them, spreading the reward benefits more evenly. Easier detection of malicious activities and an incentive to act fairly: Voters can identify nefarious actions in real-time and use their votes to remove the undesirable delegates from the system. At the same time, the delegates are aware of the potential to be voted out and lose their funds and reputation in the process. In this manner, the DPoS offers mechanism which discourages users from engaging in destructive behavior. DPoS mechanism is described as more energy efficient: The use of the DPoS algorithm is associated with the less energy consumption as the witnesses follow a schedule in determining who will add a block to the blockchain. Compared to PoW, for instance, there is no need for the harsh competition for the addition of blocks. The Aurora platform goes for streamlining its performance by implementing yet another technological layer: its P2P Stereo-net technology. This tech works as a broadcasting network consisting of numerous different nodes running the User Datagram Protocol (UDP). At the same time, there is also a connection between proxy candidates which uses the Transmission Control Protocol (TCP). The Aurora network implements the layering system which is supposed to ensure faster and more secure communication. Based on the layering principle, the proxy candidates are allowed to establish a direct connection via the upper layer of the network. This system works in synergy with the described Byzantine Fault Tolerance mechanism whose execution between proxies becomes much faster in this manner. How Does Intelligent Application Isolation Tech Work? After the transactions are verified, the proxy nodes send them for processing to the so-called Pending Zone. Smart scheduling system features automatic reviewing of transactions, contract and applications, with the Pending Zone serving as the “barrier” which ensures that all of them can function independently without having any impact on one another. The isolated elements which are being reviewed are first identified and classified, such as in the case of separation of contracts with varying fees or categories. As for transactions taking place on the blockchain, the system oversees them to ensure their fair and balanced handling while preventing the potential clogging from having an impact on other transactions in the pipeline. Each contract is checked in real time to make sure that any modification it requires is made with no delay. In this manner, the Aurora blockchain is supposed to deliver increased efficiency and steel itself against potentially malicious attacks. How Can Aurora Improve the Smart Contract Ecosystem? Its cross-chain technology allows holders of the AOA token to establish communication between different chains via Aurora’s cross-chain communication protocol. 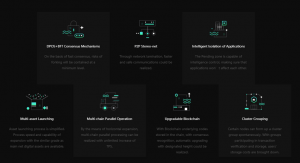 Multi-chain technology supported by Aurora allows it to offer better transaction processing efficiency compared to single-chain environments which are often impeded by encryption algorithms and online transmissions. At the same time, Aurora’s P2P Stereo-net technology is in charge of ensuring consensus across chains and making the multi-chain transactions processing run smoother. Multi-asset launching technology makes it easier to launch tokens and bring their use efficiency to the level of the main chain coins. Based on this, various tokens can be used in contracts in a simplified manner, while eliminating the need to introduce other contracts for that purpose. The Aurora network nodes can create cluster combinations which allow nodes to take part in transaction validation and storage provision for the purpose of reducing the storage costs for an average user. This is rewarded by the bonus the cluster members receive in AOA tokens, in a process described as being similar to mining. Finally, Aurora wants to make its blockchain automatically upgradeable. Aurora uses LLVM compiler to bring together the blockchain code and contract scripts under one umbrella. With it, blockchain upgrades will be made available to all clients who previously used an old version via appropriate links. a) The means of payment in the Aurora ecosystem, acting as its “fuel”. b) The unit used for data exchange on the platform. c) The foundation of the Aurora’s reward system, in which this currency is given to the users who contribute to the community by tweaking its code, ironing out the bugs, providing optimization suggestions and promoting the network itself. d) As the bridge between the communities and developers using the Aurora technology. AOA tokens have a total supply of 10 billion units, with more than 6 billion of them in circulation as of December 2018. Officially supported wallets for this token come in two flavors - AOA mainnet wallets are aimed at developers and used as a visual interface for managing accounts, handling trade and smart contracts. AOA Lite wallets are personalized mobile wallets user for fund transfers and account management. In early December 2018, the token’s market cap stood at just above USD 111 million. The AOA token is available for trade on the crypto exchanges such as KuCoin, CoinEgg and others. Aurora CEO and founder Aqua Zhao previously headed the ABitchain (ABTC) company which announced its integration with Aurora in May 2018. ABTC tokens issued as part of its earlier ABitchain project were automatically changed to AOA following integration. Aurora mainnet itself was launched in September 2018 as the group effort of the Aurora team headed by Zhao and Bo Zhang who currently serves as the project’s global marketing executive.